I took the rest of last week off after I got back from Florida to collect myself and I guess that I just wasn’t done with my time off! I hope you are all doing well. Happy Monday! I came home to some awesome pressies from One World One Heart, this was the final year but Lisa from A Whimsical Bohemian has come up with another idea for next year 2012 that I think you are going to like. Go to her website to see her plans for the next year and sign up for her newsletter informing you of what and when things are going to take place. 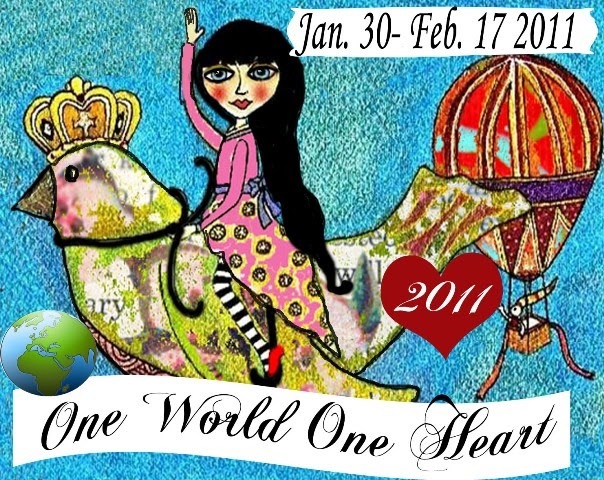 I am so glad that Lisa Swifka has decided to add another event even though One World One Heart will never happen again. Anyway I am going to show you my first gift and Blogger today. This is what came in my package, 3 small stones with writing on them. I love them and I needed this message on that day. I tend to forget sometimes with all of life a blur around me the most important things, Be open, be whole, and Love life. This was so perfect. 3 small stones filled with so much love and a powerful message. They will remind me of the message and the OWOH event for a long time to come. You can get some of your own from Kim de Broin Mailhot, the Queen of Arts herself. I also got from Kim a wonderful little hand written note and four “Love is” Note Cards. 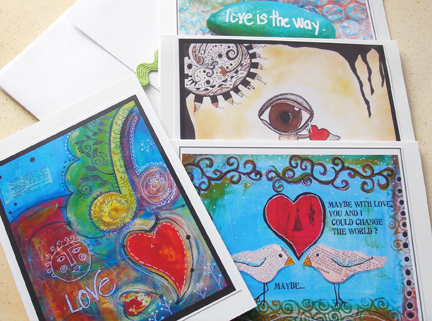 Beautiful Cards with messages that sang to my soul, I was so happy to have gotten these. 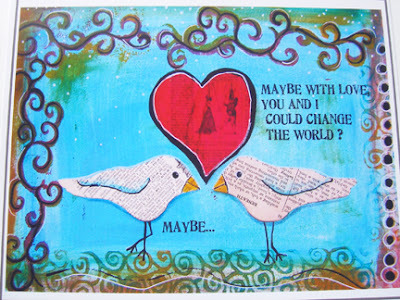 I ﻿adore this one, how wonderful the message is. Maybe we can, that is what I am thinking. You and I can. Kim also has a blog and you can find it here. Thank you so much Kim, I like your style. I had a great time with OWOH and I had an even greater time when I got home and saw these. Gosh I love these, how am I going to use them? I don’t know if I want to give them away or send them out, I may have to frame them. To remind me all of the time. I am in lovely Florida visiting my family. Geesh, it has be so long. My mom and dad look fantastic!! My mom looks like she is younger than me. I am so glad to see they are so healthy and happy. My beautiful sisters and their families are doing so well. Even though I am in Florida, I brought my door prizes with me and I am going to mail them out from here. So contact me with your address and I will ship them from here. This OWOH has been fantastic and I have had so much fun, I have not been able to visit everyone that visited me, life has been pretty full. I will try and get to you after, if I have some time. Know that I appreciate all of your comments and love that you came by to see me. Thank you!! The winner of the OWOH commemorative piece is……………….. I truly hope that these pieces bring you both all of the abundance they are intended to!! Off to play with my family, YES!!!!!!!! 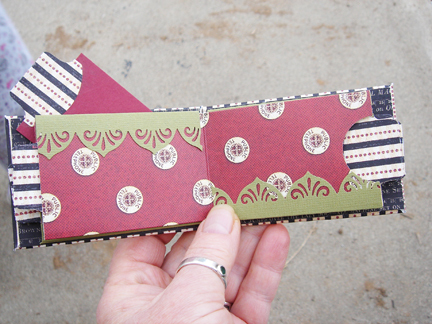 Fave Crafts Blog Hop- February 15th , already??? 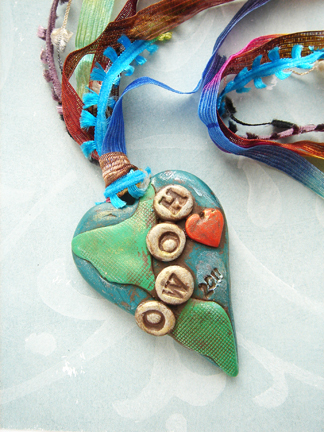 Finished on the 15th, Fave Crafts Blog hop happens on the 15th of every month. Like clock work. Click to go to all the other Hoppers. I was not prepared for it all to happen on the 15th of this month, I mean everything that is happening is happening on this day!! LOL. Not quite, but it seems like it to me right now. So I have really finished nothing this month. SO……….. 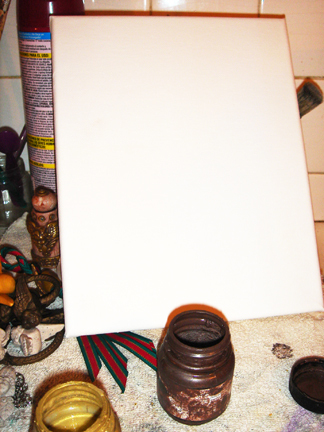 I decided to show you a quick acrylic paint wash easy background for a collage. Thank you for stopping by. Have a great time crafting. Flowable extender- just ask Howard for it, we have it. This was for a friend for Christmas. 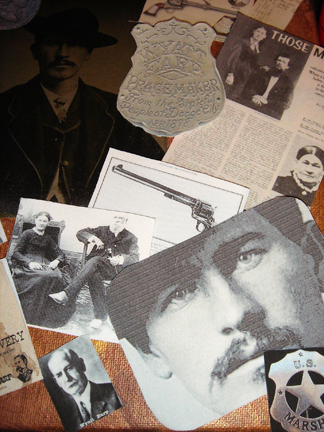 It is my friend Jodi’s hubby, he is something of a wild west fan and historian. He tells great stories and studies profusely. I had the chance to blow this every step of the way (finding the wrong information or pictures) and I am making this on the 23rd of December. 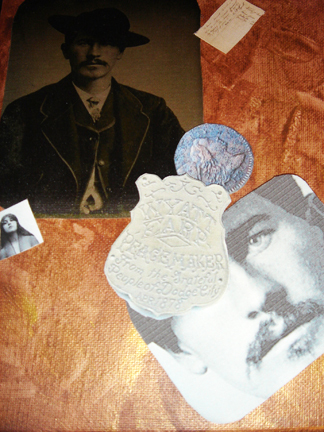 I look for trivia and anything I could find on Wyatt Earp and Nelson Story two of his favorites in old west history. Now this was fun and I took a chance with the stuff I used it could have all big propaganda and lies, but I went with it and I loved reading about these guys the myth, legend, and the lies. I wasn’t there, it is all propaganda to me. I know how stories get twisted in families. Everybody does it. I printed the pictures I was going to use on the cotton paper. It is sheet of paper with fabric attached to it so you can run it through your Ink Jet Printer (I am having so much fun with this stuff). I printed the dates and words on a sheet of the silk paper. I used the silk for this because when I used the flowable extender the silk tends to fade away and the words are just left. 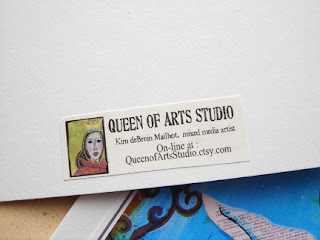 This works with encaustic collage too! I do these first to give the ink a chance to dry before I use it. Otherwise it gets on my hands and comes off in my brush too! Flowable extender is a gel medium and if you want a thicker one you can use the Jacquard Silk screen flowable extender. The one for the Lumiere and the Ne-opaque is thinner and is nice for thinning the Ne-opaque and Lumiere and for using as a standalone product too. I like this as a thinner more than water, even though water does work also. 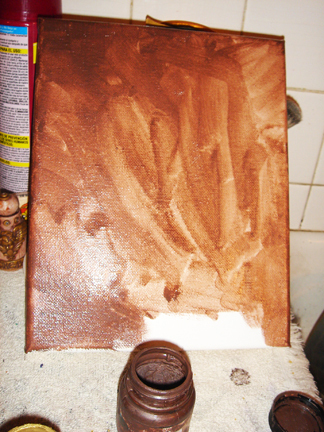 I took the canvas and thinned the Brown Ne-opaque with the flowable extender and slapped it haphazardly on to the canvas. That means quickly and with no deliberation, Just do it. 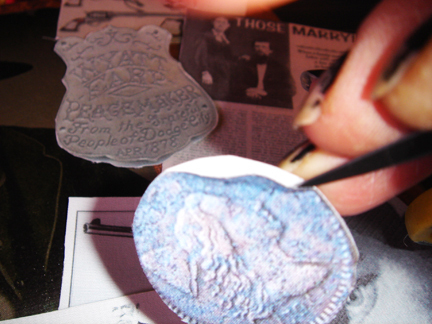 Roughly looks best and you can scrub it on in places and add it on like painting a coat of paint too. 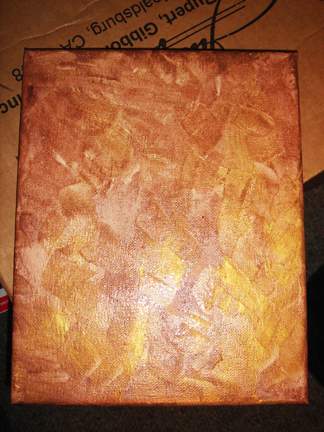 I even painted the sides of the canvas too! That way they can be hung right away while looking for the perfect frames. Some one should really clean up my area. LOL! 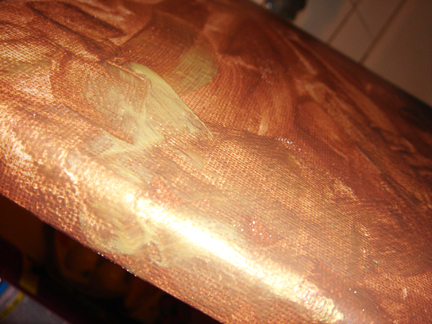 While the brown was still wet and workable and added the Gold Lumiere. In patches according to taste. I did not want the whole thing goldy, but for it to have highlights of gold in different light. I took these pictures about midnight. Sorry for the bad lighting. You kind of see the gold in there. It is really yummy though. 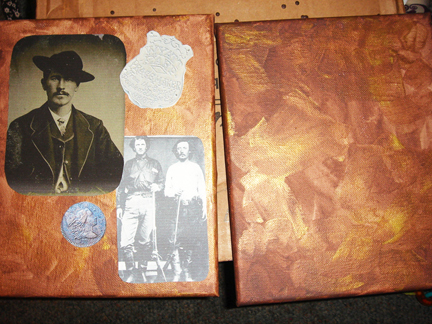 I messed around with the placement of the pictures before I started “gluing” them on with the flowable extender. You can see he was a very good-looking man. I am getting a pretty good idea of what I want to go where now. I had some scraps of the fabric paper left over so I thought I would use a fine point Tee-juice pen and see if I could draw on the paper fairly well and you can and I am probably going to pursue this one later on. Just think Zentangle quilts, wall hangings, or fabric collage!!! 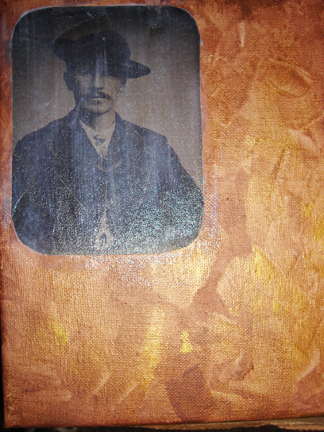 I am thinking too I could draw my own stuff, heat set it, and then use it in the encaustic. yummmmmmmmmmmmmmmmm! 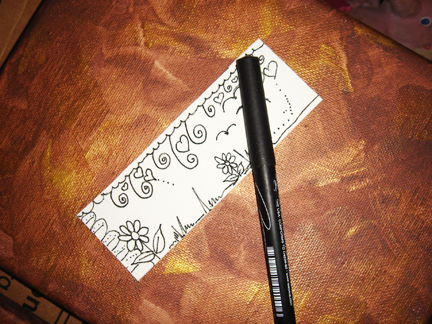 It was so easy because of the paper backing and the tee-juice pen is juicy and keeps on flowing, I loved that. It was just like drawing on a piece of paper. Sorry, side tracked. Pretty, shiny thing. First thing you want to do when starting to use the paper is get the backing off of the fabric. I lift it up around it and then get a big piece of it and pull away! If your scissors are really sharp be careful of cutting yourself and the fabric. I paint the back and the front of the fabric with flowable extender and then paint the canvas where I want my fabric to go. 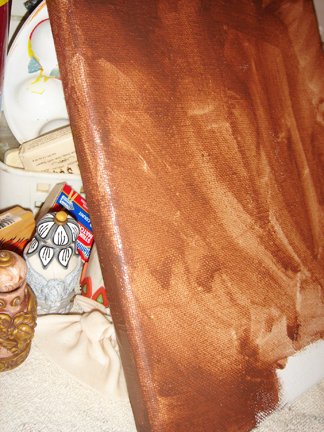 I then lay the fabric picture on the canvas. 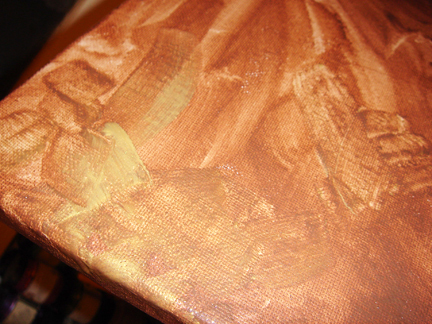 I then brush more extender on and brush out any air bubbles underneath the fabric picture. Add more pictures overlapping them, this same way. I don’t have the finished piece pictures I will have to get you one next time I am up at Jodi’s. I did a good job on these and when I gave them to her husband I found out that I didn’t do too bad in my choice of pictures. I added the dates of his birth and death and Wyatt’s name in a great font and also added some more scrolly painting and highlighting with the gold paint, I have to admit I really like them and may even do some more of these. I can also see how some of the techniques I used here could carry over in to other aspects of my art play. Have a great blog hop! My friend Anne at El Milagro studios has just done a bang up series in Gel mediums and I think you would really enjoy them you can find them here. For December’s Fave Crafts Blog Hop: there are some great links here if you are interested and a complete tutorial. Madi plays! Happy St. Valentine’s day! I know I am her grandmother. I know I am so prejudice. I know. But Geesh, this girl is cute! Happy Monday to all of you. May your week be full of wonderful surprises and blessings. May all of your hearts be filled with Valentine’s like this. Happy Birthday, Howard. I love you very much. I myself have been travelling on the OWOH flight trying to visit all the blogs and meeting new people, artists and bloggers here. Whether you have a blog or not it is a great list of blogs and people that are participating this year and you never know you may even want to try this out too, you still have till the 12th of February. This is the last year for this blog social for Lisa Swifka. This is also a big gift from Lisa with as much work that goes into this. Thank you again Lisa for all the years you have done this. Thank you so much for this year. 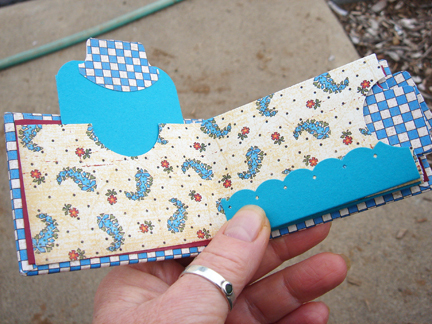 I did make some little tiny scrapbooks that fit in the palm of your hand, with Jodi and my daughters, OMG, they are so cute and you can just whip them out. 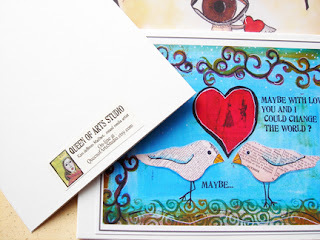 They are from Laura Denison’s page, Following the Paper Trail! This one is mine. 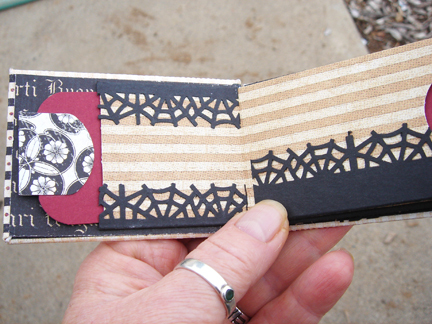 Spider web border oh yah! This is my youngest made this one. And this is Jodi’s, she always does a great job. I have been also recuperating from going to CHA and taking it pretty easy last week I have some videos from there. I have the Makin’s clay Interview Video loaded up on my YouTube channel now. Also I went to see Madi’s last soccer game over the weekend. It was so cute, I mean to tell you, so cute. These little guys are under two years old and playing soccer, well kind of. I took some videos, but I have to edit them. I hope to have that up soon. 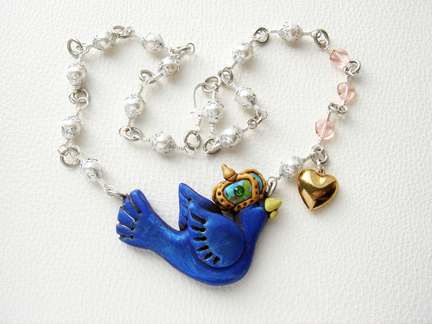 I have been putting a lot of time in to taking pictures and loading up my new Etsy Store, the Hoarders Closet. I have added a link to the right side on this blog. 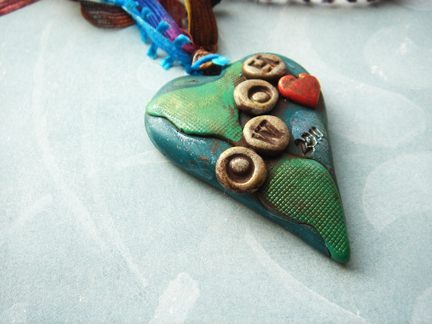 Handmademom made a steampunk brooch from one of my findings and let me use the picture on my listing, YAY! Thank you Handmademom for being so talented, you make the findings look great!! I appreciate all that have bought and looked, Thank you so much! I am going to ask you all again to pray for another dear blogger friend of mine. She is going to have surgery on the 25th of February and I need your help to keep her lifted up in the light. I know that there is big, big magic and love here in blogland and this lady is very dear to me!! Have a wonderful weekend everyone and hug one of your family, a tree, a friend, your pet, anything to make you feel connected here. This post is to say hi to everyone and to show the now finished OWOH pieces. 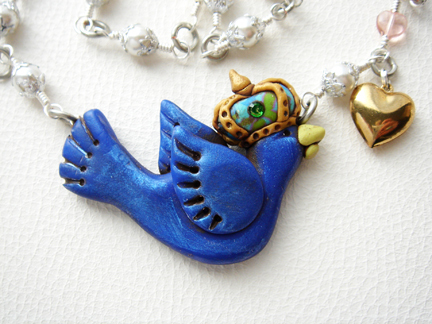 I finished the Blue Bird of Happiness necklace. I love him! I am really happy with the beaded part, I used faux pearls and silver bead caps on each one, I wire wrapper each link in almost a rosary flare. On the right side I used 3 pink glass hearts and a little gold tone metal heart hanging from it. I thought if I used the gold in the crown and the little gold heart that it could be worn with either metal. 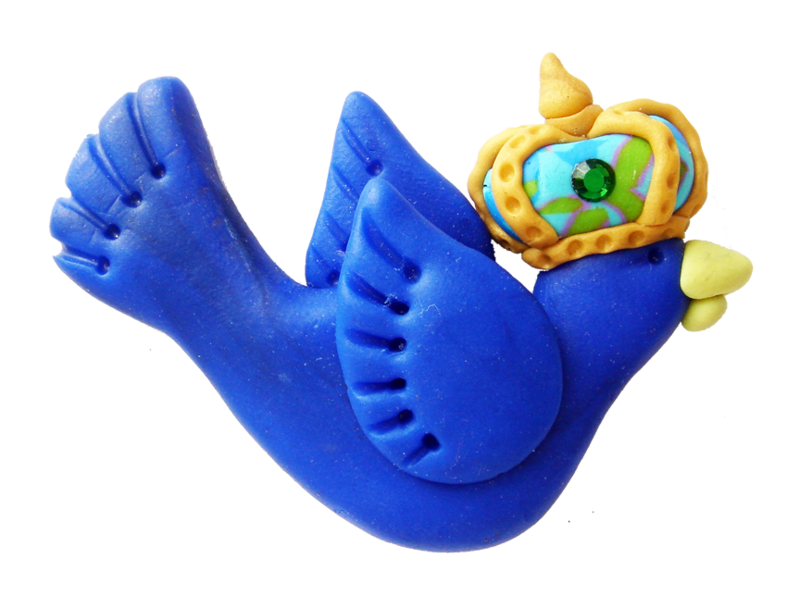 I added an iridescent blue acrylic paint to the blue bird to give a sheen to his feathers and then I added a blush of gold acrylic to the crown to pop that out. To top that off I have a green crystal on the crown. I added a handmade 20 gauge non tarnish silver wire hook with a 16 tinned copper jump rings. All the the faux pearls are wrapped with 2o gauge non tarnish silver wire. The non tarnish silver is copper wire with a silver plate, the tinned copper wire is copper with a tinned plating. This will go to the first person picked. Unless of course the wish to have the heart here. 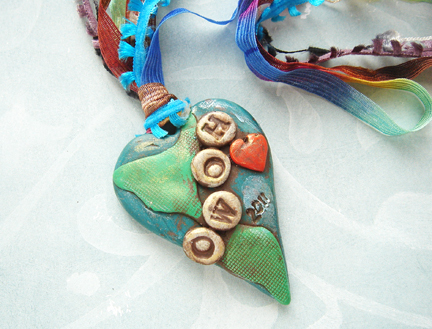 This is the OWOH commemorative heart necklace. 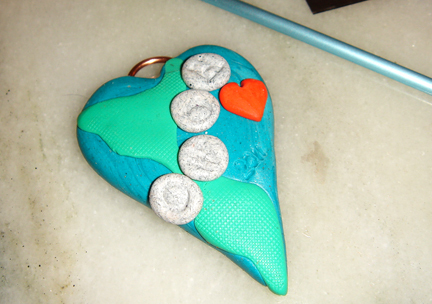 This is a world heart with OWOH letter circles of granite clay on it. I also has a red heart on it. It also has the year on it because this is the last year that Lisa Swifka at A Whimsical Bohemian is going to do this blog social and you can see from the other people that are involved in this project of hers that this has been a life affirming and pleasurable experience for all of us. Thank you Lisa, this is a wonderful thing you have done and I, for one, appreciate so much all of the work and hours you have put in to this event and I will miss the magic of it. But as I am starting to realize, somethings are never copied or remade in the same magnificence of the original. So those are my two pieces. And if you follow or read my blog, but you do not have a blog, you are so welcome to play and enter also. Enter here. *updated 02-01-11* another piece added scroll down to picutre of heart. Welcome to my blog, Art from my Heart. My name is Marie Segal and I am a stay at home gramma and artist. Sounds like a 12 step meeting doesn’t it? In a way it is. I work for myself and I create, teach, and live my artistic life, I also watch my 2 year old grand daughter, Madi, 5 days a week and sometimes on the weekend when her mother has appointments or things going on! We, though, are learning to share with each other. The thing about working as an artist sometimes is that if you do not do the work or you are sick, you will not get paid, so it has been a process of learning how to stay motivated and make things, write about them, and teaching. I can not just play when the muse comes to visit. I have to play whether the muse comes or not. I entered in to the OWOH giant blog meet and greet last year, at the last minute, when I my Mother in law had just passed away and I needed something to fill up my brain instead of the sadness. This was actually one of the best things I could have done. This set me down right in the middle of a huge creative community, people searching for themselves and looking for what makes their hearts sing. It also became the time when I started feeling like a blogger and relating to the other bloggers around me. 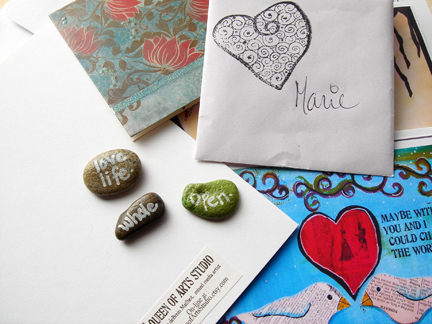 Being a stay at home gramma and artist can be an isolating experience, but not now, I have a community here and you can too. Visit the other multitudes of people here. Also if you leave a comment below I will give you a entry in to my giveaway. I am going to make something out of this OWOH bird, either a necklace or pendant, I have even been known to add a few more pieces if I have a lot of comments, I do have my comment moderation on and I will be out until tomorrow until 1/31/11, leave your comment anyway, they will post when I get back. Thank you for spending a few minutes of your precious time with me, I am honored by your visit. I was gone all weekend in Los Angeles, thus the brief post for OWOH. I am going to be closing this early on the 16th, but will posting the winners on the 17th and sending my stuff out from the other side of the US. My daughters got me a ticket to go see my mother and father. It was my Christmas present, along with a scrap book already set up for florida and my visit. I couldn’t figure out why they would give that scrapbook. I kept looking for clues and they said MOM, don’t you get it? You are going! It was one of the most heart loaded surprises of my life and I get to spend a week with my mom and dad. I just wanted to share this with you that are going through some tough times too. You just never know when someone will literly make your day. Keep your chin up and keep smiling. When this ends I will be on the other side. I am now working on some more pieces for this event. This is a glimpse of what is coming next and it will evolve in the process, but this is commemoration piece for this OWOH Journey we are now on. Blessings all over you all. 2nd piece, not finished yet though! This how Lisa describes her wonderful event! One World One Heart is a worldwide event for bloggers only. It gives all those who blog a chance to meet and mingle and form connections with those they may not have otherwise met from all over the world. In the past 4 years this event has grown to over 1,000 participants with lasting friendships (and even one love connection) formed along the way. 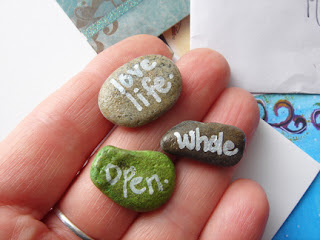 Think of it as a GIGANTIC open house allowing you to travel without ever leaving your home……..going from blog to blog(in various countries) seeing the wonder each one has created and meeting all the fabulous people behind those blogs. As a bonus each blogger participant will offer up a “door prize or prizes”….just for dropping by, saying hello and seeing their world. It’s really that easy.